With work on the last big update now on the way, let’s take a look at what we’re going to do with enemy factions on the worldmap in order to make the world more interesting and dynamic, and how it’ll affect you as the player. Enhancing the presence of factions for a more dynamic world is one of the goals of the upcoming update, and this includes enemy factions. Previously, enemy locations, like bandit camps, just got different banners assigned randomly, which then were also used by any parties created by that location, and that was it. Now, we’re going to introduce actual independent sub-factions, like orc clans and goblin states, which occupy territories on the worldmap and seek to expand them. Orcs, goblins, bandits and undead each received half a dozen or more new banners on par in quality with the new mercenary banners introduced not long ago. 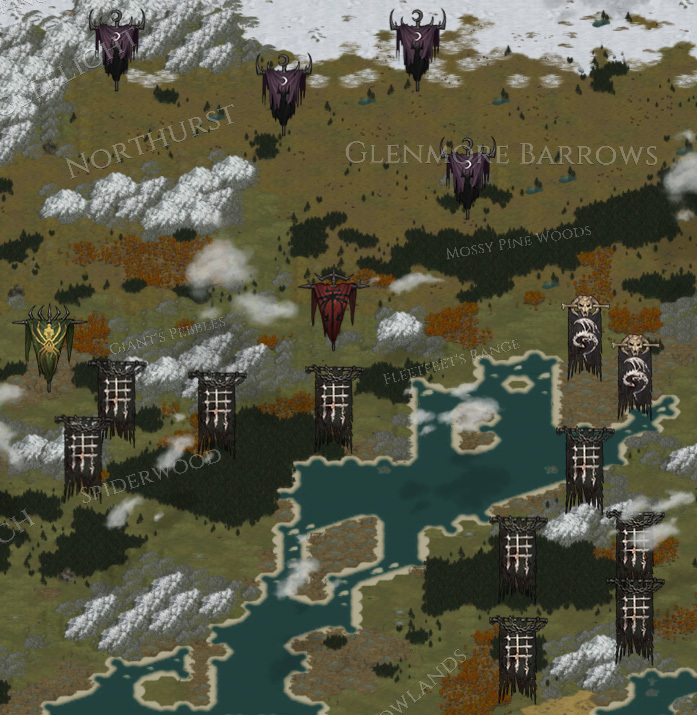 You’ll be able to see by those banners on the worldmap where a faction holds power much like you currently do with noble houses. 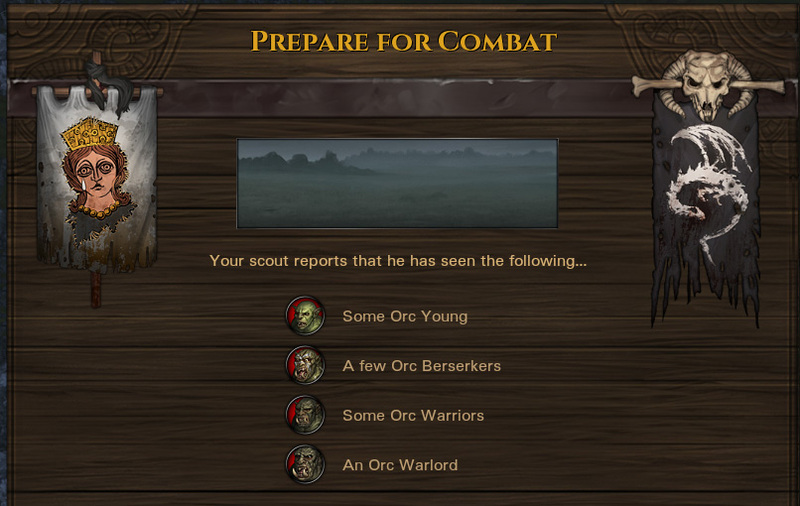 Take a look below to see a very strong orc faction fond of grates in the southern part, smaller goblin and orc factions bordering them, and a strong goblin faction to the north. Factions are most active near their territory – sending out patrols, hunting or raiding parties, and actively defending their territory against intruders. While this was somewhat the case before already, it now also applies to contracts. In previous versions we often had to spawn locations and enemies all around the world artificially as part of contracts, just to give you enough to do. With a steadily increasing number of different contracts, however, we can now go back to having contracts appear when there is actually a specific threat in the vicinity, safe in the knowledge that there’ll always be some kind of work to be found. For example, settlements bordering orc territory are now much more likely to require your help in fighting off orcs, and conversely, destroying that single orc camp near a town will erase that threat, and thereby the need for contracts against orcs, for good. Or at least until other orcs make their way into this part of the world. If you prefer to stay clear of orcs for now, you’re advised to just travel to a different part of the land where orcs have less of a foothold. Of course, those orcs may then expand their territory and grow stronger while you’re not there to keep them in check. To underline further that you’ll be fighting not just randomly spawned parties, but parties actually belonging to factions and doing their part in helping theirs to expand, the combat engage screen now shows banners of all enemy factions involved in a battle in full detail on the right, and your own banner, as well as the banners of all allies taking part in the battle, to the left. Will the faction be able to conquer/destroy human towns? – Will they be able to fight each other? Its the best news in this month. Well that is a nice improvement, but everybody wants to know if and when are you planning to implement some troop’s positioning before the battle on the actual battlefield. Also, what about a veteran’s hall? Very nice! It’s really taking shape. “Build me an army worthy of Mordor!”.